My mother introduced me to curry. I’m not sure whether it was Indian, Thai or Malay. It was probably best described as Irish Curry: an emerald-green, subtly-blended concoction of chicken, flour, a careful dash of curry powder, the raisins obligatory in any good 70s curry, and whatever happened to be hanging around the fridge that didn’t ooze when squeezed: potatoes, eggs, cheese etc. My mum made up vats of the stuff for dinner parties and served it with dessicated coconut, banana and rice that actually bounced. You had to be careful not to drop a spoonful, or it would ricochet around the dining room imperilling the collection of Waterford glass my parents won playing squash. Really, the preceding paragraph speaks volumes about my family and upbringing. In case your volume is turned down, that would be: middle-class Protestant. When I moved to London in the early 90s, I took an occasional detour from my staple diet of Pringles and Alpen to dine at restaurants. I didn’t limit myself to Indian eateries, but I certainly partook of the odd chicken korma – more accurately known as ‘English Curry’. My enthusiasm for Asian cuisine remained undimmed, despite a number of chicken kormas re-emerging explosively via my nose. This enthusiasm encountered a set-back when I arrived in Dubai during Ramadan 1998. I was invited to lunch with a group of Indian women, who had each brought Tupperware containers of food which they arranged on a table in the staff pantry. I’d heard rumour of ‘real’ Indian curries that literally scorch your eyeballs out of your skull, but frankly I didn’t believe it. The food was delicious and – although spicy – nothing to alarm my digestive system. It was then I realised I had the constitution of a cockroach genetically crossed with a rat. There was a bowl of light green sauce standing in the centre of the table, which looked innocuous despite emitting a faint glow. I slopped a wodge of rice around the sauce with my fingers. Then I popped it into my mouth. Within seconds, a fireball exploded in my mouth and swept through my body, squeezing the moisture out of my pores. I wouldn’t be surprised if I actually smoked. I was convinced I was dying. It was then I realised my constitution was more aligned with an Irish Mick whose definition of ‘savage spicy’ is salt and pepper. Duly chastened, it was some time before I risked another confrontation with Indian food – this time with more respect, caution and humility. At the time, Kwality Restaurant on Khalid bin Walid Street near Budgie Roundabout was commonly agreed to serve the best Indian food in Dubai. At least according to the expats; the Indian community likely considered the food insipidly bland. For a ridiculously reasonable price – around $10 – you got a slobber-fest of warm puffy naans, poppadums, rogan josh, sagwala, tandoori, chicken makhani, fish curry, fluffy rice, and mango lassi. I took my parents there the first time they ever visited me in Dubai. Then I met Andrew – and that was the end of that. I’ve already written extensively about Husband’s timid, capricious palate that only responds to regular protein massages. One of his culinary foibles is antipathy towards Indian food. When I ask him why, he says, “Don’t like it,” and clamps his mouth shut to ward off my potentially force-feeding him a spoonful of biryani. We had just moved in together when I rang Boyfriend on the way home from squash practice one night and asked him what I should pick up for dinner. He foolishly insisted that I choose. No doubt he thought I loved him so much that, knowing how much he detested Indian food, I would never subject him to it. Not the first time he’s been mistaken. It was unfortunate that it was late and Boyfriend was hungry and got perhaps over-excited upon sighting the mound of foil-packed cartons. Also particularly regrettable was my choice of delicacy to convert him to worship at the altar of Asian cuisine, but I’d thought lamb rogan josh was fairly safe. I’ll never forget the look on Andrew’s face when I removed the carton lid with a flourish to reveal a steaming pile of what looked it had just been processed by at least five cows’ stomachs. “Oh, just TRY IT!” I snapped. I think it was the SCHLOP! sound it made sliding onto the plate that sealed its doom; Andrew flatly refused to touch it – or, for that matter, my chicken korma – and instead nibbled with pointed silence on a cold sausage. Thereafter, I focussed on food that didn’t make Andrew dry-retch. Two weeks ago, Agent of Death made curry for dinner. Although Agent of Death looks like the type of man whose diet consists entirely of rare carcass, his choice of flavours is actually confounding. In fairness, he also looks like the type of man who could chew raw chillies whole without breaking a sweat, and this in fact is accurate. He loves him some spice. Agent of Death’s fish curry was the first time I’ve had Indian food for around 10 years and it was sublime: tender bites of blue cod with lashings of ginger, garlic, chillies and coriander all bound together in a coconut base. My love of Indian food re-awoke with a roar. Since Husband said Agent of Death’s fish curry was ‘nice’, I took him at his word* and have been working through Agent of Death’s fully illustrated ‘The Food of India’ book (highly recommended) of Indian recipes, cooking curries for the family once or twice a week. 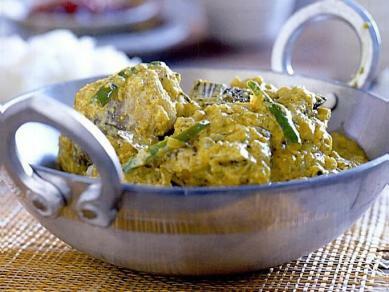 We’ve had Molee, Fish in Yoghurt Sauce and a delicious Toor Dal with nibbly mustard seeds MMM. Next up will be Chole Chaat. I sometimes garnish my curries with torn banana in honour of my mother – and to disgust/horrify Agent of Death. Which takes some doing. Middle-class Protestant, I’m thinking Very Progressive Middle-class Protestant. I thought that for most people in Ireland curry is that brown gloopy sauce you had on chips. And that was 90s Ireland, so your Mum was well ahead of her time. A staple cookbook here in this household is Atul Kochhars – Simple Indian, but we warned it the dishes can be time consuming to make, but well worth it. Well since I don’t really do the cooking it is easy for me to say that. If you ever come to Melbourne you will be cooked a meal from it. Now if you bring Andrew we might just change the Menu to one of Gordan Ramsay’s recipes instead. Gosh, Mum’ll like YOU. Her curry recipe was from her Good Housekeeping Cookbook, which she was given as an engagement present when she and Dad lived in Australia. So it wasn’t technically Irish, but her interpretation was. I’m going to risk offending THOUSANDS here – or at least the subset of 10 that read my blog – by suggesting that the classic 70s English/Irish curry is really more ‘gloop’ than curry. I too remember those 70’s English Curries. There had to be sliced bananas, dessicated coconut, chutney and cucumber with them. If you were really advanced you cut up the cucumber and put it into some plain yoghurt and called it raita. Our friends the Bethams also served “Bombay Duck” with their curries. These days I have advanced to Madhur Jaffreys Indian cookery. Not bad – and she tells you how to substitute if you have difficulty finding an ingredient. I also remember the rage for Alpen. Agent of Death’s cookery sounds great. I’m afraid mum was never much into her chutneys, so we missed out on that. And raita sounds like a whole new level of elegance. I might have to source one of Madhur Jaffrey’s cookbooks for Agent of Death – it sounds just his bag. I had NO IDEA Indian food was such a favourite for home cooking. Ok, it’s FAR too early in the morning for me to even THINK about curried eggs. It sounds completely heinous – in the same league as nasty 80s salads. But you love preparing 80’s salads for my visits. It’s one of “our” things dreadfuljelly – please to be not disrespecting the 80’s salad. Thanks to your recommendation I am now the proud owner of “The Food of India” and am planning meals from it. It doesn’t overlap too much with Madhur Jaffrey’s offerings (on first glance I seem to have spotted one of my favourites, under a slightly different name) and I love the chatty sections. I’ll let you in on a secret: I am addicted to cookery books, often read them for guidance and inspiration and only occasionally follow recipes slavishly. MarkJ – I will never stop making nasty 80s salads for you, but a big part of the preparation is disparaging. A bit like asparagus, but more astringent. Mumsie – so pleased you like it! We haven’t had a dud recipe from it yet – and I love the sections at the back on making coconut cream and garam masala. I’m a fan of cookery books myself, Hunka can’t understand it.